You are here: Home / Board Games / Chickyboom Game Review – The Rocking Rolling Roost! 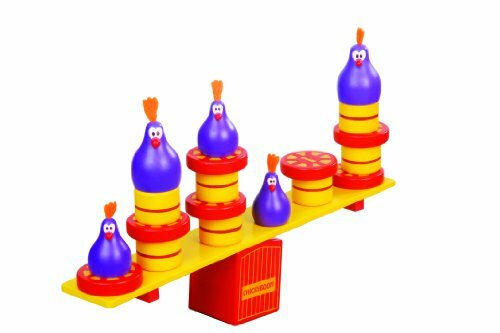 Chickyboom Game Review – The Rocking Rolling Roost! 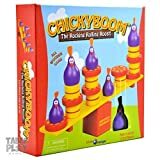 Families will love to play Chickyboom! It’s a fun, easy, intense game of balance. The game includes chickens, wagon wheels, and hay bales to stack on top of a teetering perch (a platform balanced precariously on a base). The game is rated for ages 4 and above. 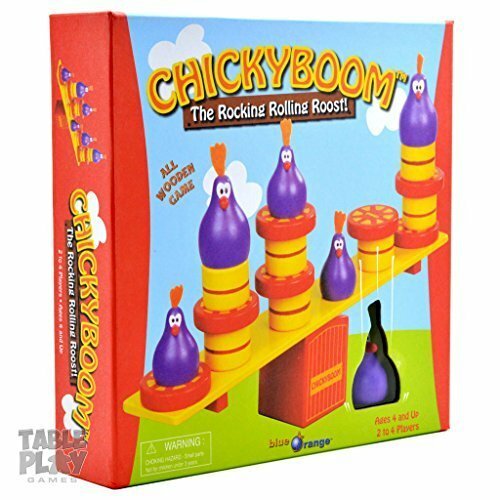 Chickyboom is an exciting game that includes both cooperative and competitive play. Kids can develop their fine motor skills in a fun and easy way! The game components are high quality, they’re wooden! All paints used on the game pieces are non-toxic. The game is very easy to play (great for young kids) and there are different modes of play so the game can grow and continue to challenge kids. Set up is quick and easy. The games starts with someone placing all of the chickens, bales, and wagon wheels any which way the on the wobbly platform. Players then take turns removing one piece at a time from the perch. Every piece is worth different points based on how much they weigh (hay bales are 3 points, chickens are 2 or 3 points, wagon wheels are 1 point). The game is over when all pieces have been collected or when the rocking perch topples over. The player with the highest number of points is the winner! The “Basic” mode of play is a great way to play when kids are really young. No points are collected with this mode as players remove pieces. Instead, the last player to remove a piece without toppling the perch is the winner. This type of gameplay introduces kids to the basic fundamentals of physics and develops hand-eye coordination. As kids grow you can adjust the game to continue to challenge and teach them new skills. The more advanced gameplay teaches kids strategy and basic math (counting, addition, and subtraction). Quality solid wood game pieces. Different modes of play to continue to challenge kids and develop different skills. Quick and exciting to play. A great way for busy parents to engage with their kids. Chickyboom is a really fun game made of high-quality durable game pieces. It earns a high replay value because of its flexibility. The different modes of play and the multitudes of stacking options will continue to excite and challenge kids.